Favourite Early Season Hike- Visit the Grasslands Today! 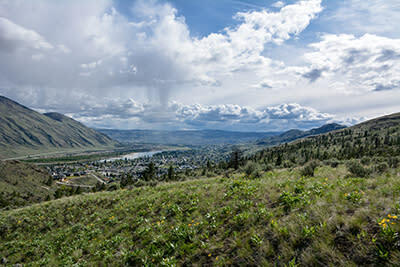 From the “meeting of the waters” in Kamloops the hills rise above the valley on every side offering hikers an opportunity to walk through the grasslands in 3 seasons. The hills first start to clear of snow in early March opening up trails in the lower grasslands. Right on the edge of the City is the 15000 hectare Lac du Bois Provincial Grasslands Protected Area (BC Parks) and the Lac du Bois Road goes north into the lower grasslands, then up through the middle grasslands to the upper grasslands near McQueen Lake. 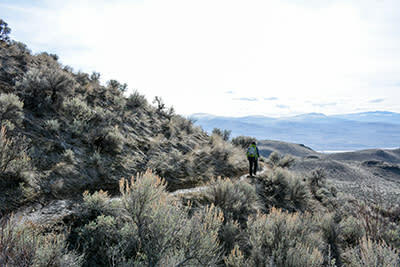 Hikers and mountain bikers go to the sagebrush and bunchgrass lower grasslands by driving up through Batchelor Hills for 2 km to a signed parking area and trail network directions. Wildflowers appear in March with sage buttercups, yellow bells, making the first appearance. Meadowlarks sing from their perches on sagebrush and bluebirds flit through the treeless landscape. By driving farther up the Lac du Bois Road, hikers can venture into the middle grasslands. The sagebrush disappears and bunchgrass dominates the rolling hills. At 9km there is a small parking area on the right directions for a trail that wanders past ponds and over open hills to views of 1.5 km Long Lake. Curlews and sharp-tail grouse can be spotted in this zone in the spring. Ducks and geese dabble and dive on the ponds. Killdeer and a variety of smaller grasslands birds keep low around the wet areas. Raptors circle overhead. Burrowing owls are native to the area. Wildflowers bloom in spring covering the slopes with spring beauties, old man’s whiskers, buttercups, camas, woodland star, yellow bells, vetch, yellow daisies, alumroot, and many more link to Kamloops Wildflowers video. The upper grasslands can be explored at Lac du Bois and for 3 km beyond (directions). Small lakes, aspen groves, and hills with open forests of douglas fir can be explored on foot. The Nature Conservancy of Canada has a protected area allowing low-impact recreation to this unique habitat. Bears, deer, and a wide variety of wildlife can be spotted if hikers walk quietly on tracks to the east and west. Chocolate lilies and a display of shooting stars, tiger lilies, lupine, fairyslippers, sticky geranium, clematis, and many more varieties that greet hikers from May to July. Waterfowl can be spotted on a number of small lakes and ponds. All tracks are unsigned, but most are in open terrain so hikers can pick their own routes. There are other trails to explore the lower grasslands. Valleyview Nature Park , Deep Lake , and the Barnes Lake Trails are good options for short hikes. Kamloops has dozens of routes, tracks, and trails into BC’s rare and valuable grasslands ecosystem.